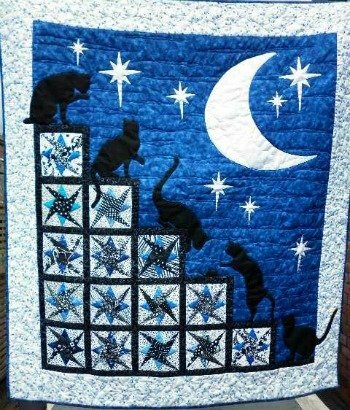 My nightime cat antics quilt is the result of winning a set of starry path blocks from my monthly quilt group. 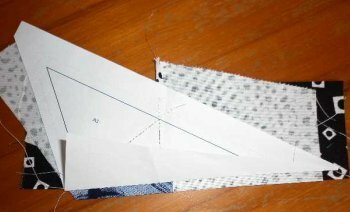 It was my first attempt at making a block pattern using the paper piecing method. Most of the women who made up these blocks found it quite frustrating but when they saw what I did with them they were very pleasantly surprised. 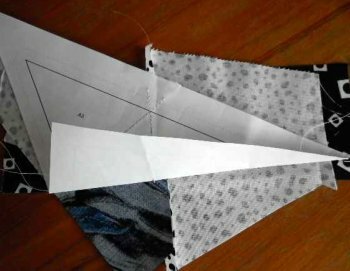 The one key to reducing your frustration is to ensure that your fabric pieces are more than big enough to cover the required pattern area. I found the cat and star pictures using google. 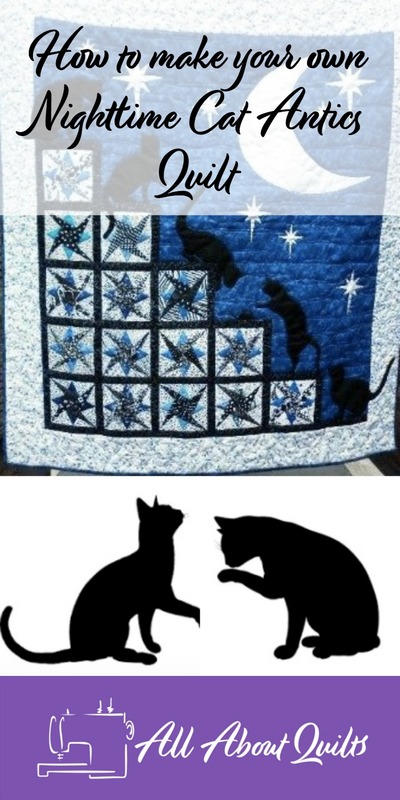 I searched 'cat silhouette images' or 'star images' until I had a group of cats & stars that I could use as a base. For Nightime Cat Antics I was looking for cats that were doing something - jumping, climbing, cleaning etc. With a little tweaking to their tails length and angle, body width or ear size, I made them more suitable for applique. I then had cat & star drawings that needed resizing. This I did on my photocopier. The same process was used on the mouse. I used a very large plate for the moon. This quilt is going to one of my daughters for her next baby. I made it as a large crib/cot quilt so that it would also be able to be used on a twin/single bed for the child's next few years as well. 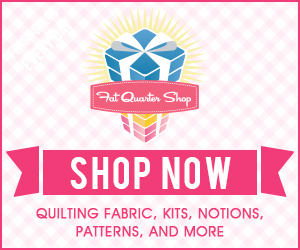 I have listed my 2 favourite tools that I found invaluable when making this quilt. The rotating mat is fabulous and one that I use for most of my projects and the fusible web Lite Steam A Seam 2 is my all time favourite. Every so often I try a different supplier but I always come back to this one. Choose your fabrics. I used a range of blue and black/white fabrics from my stash to mimic night time. 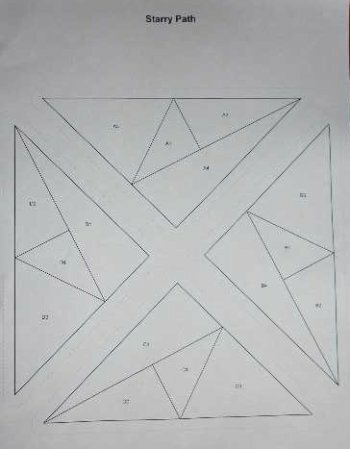 Print off the 6" Starry Path paper piecing pattern. 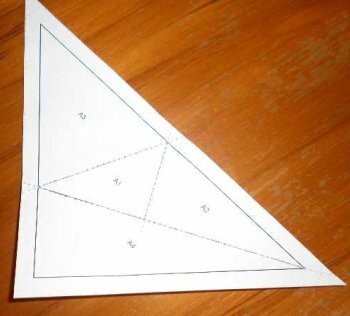 Once printed off write fabric colours to be used in each area. Any 6" block can be substituted here. So have fun and choose your favourite. 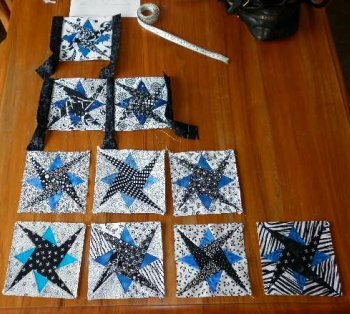 If you have never done paper piecing before and would like to use the Starry Path block - great! 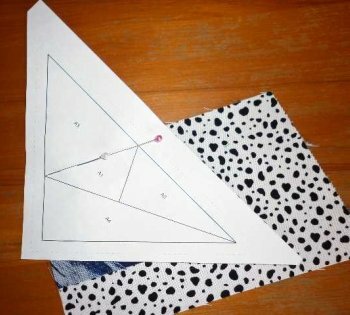 I have created a free and easy to follow paper piecing tutorial for you. So check that out first then come back here and have fun making your blocks. For those that want to make the block I used then here is how I made mine. 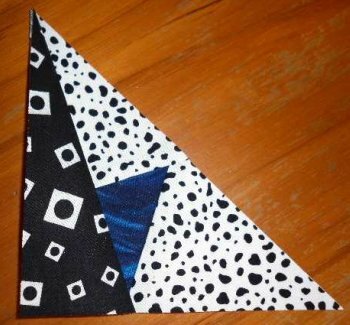 Using a blue and a black on white fabric right-sides together position with pattern right side up on top. 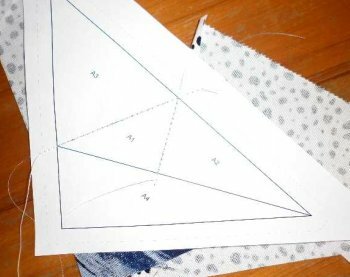 Sew along the dotted line. Position matching black on white fabric along the second line. Stitch and trim. Here is the front view so far. 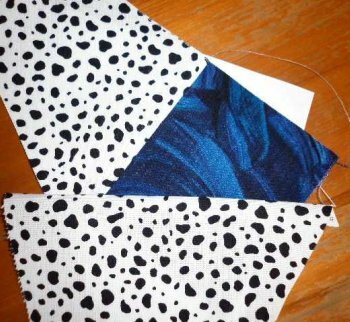 Using a white on Black fabric (dark fabric) position it along the remainder edge & stitch along the seam line. This photo shows the block before trimming. Below it shows the starry path block trimmed along the 1/4" seam allowance. Trim around your block along the 1/4" seam line. This shows the starry path block from the back. Seams sewn and trimmed along the 1/4" seam line. Below it is the front view of the starry path trimmed block. Repeat three more times using the same fabrics. Sew together with papers still in place! You don't remove the papers until the quilt top is finished. Now all you need to do is make 14 more blocks! Have fun positioning each block on a flat surface. 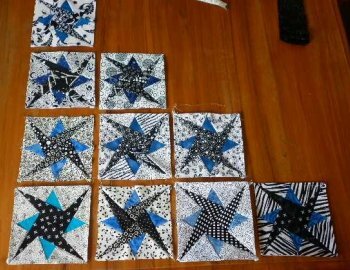 Here are some of the blocks laid out on my table. It's now time to add sashing to both sides of the blocks joining them together as you go. Next sew sashing to the top of each row. You are now ready to add your blue sky fabric to the right end of each row. To do this you need to measure the height of the rows and add blue strips to the right side. Each blue strip will be a different length due to the step formation. Sew rows together being careful to line up vertical sashing. Once completed add last blue block to the top of the quilt. Trim to required size. Border in black. Add extra borders as you want. My border fabric has wee cat paw-prints in blue all over it. Now it is time to add the applique cats, stars and moon. You can see in the photo above the words I used to search Google to find my shapes. I did machine applique using steam-a-seam and a little spray starch on the quilt back to stabilise the area of fabric that was having the applique added. 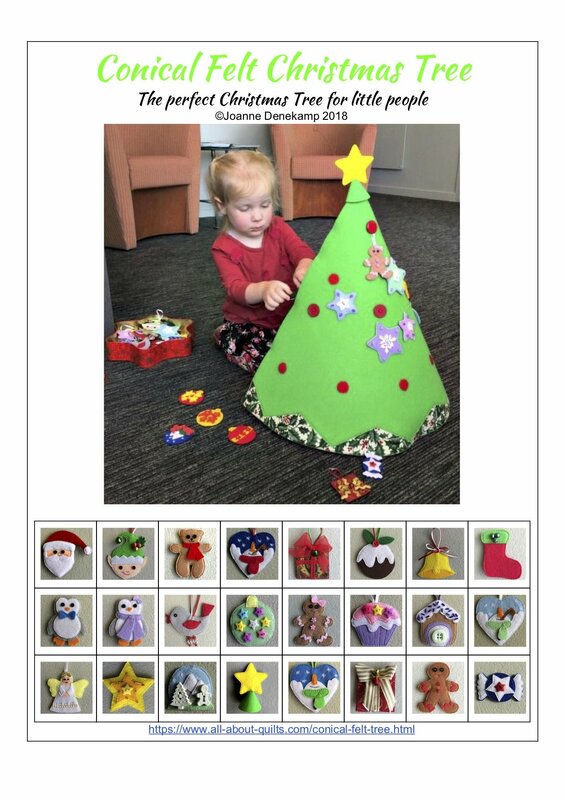 I have a machine applique tutorial that shows how I do my machine applique. 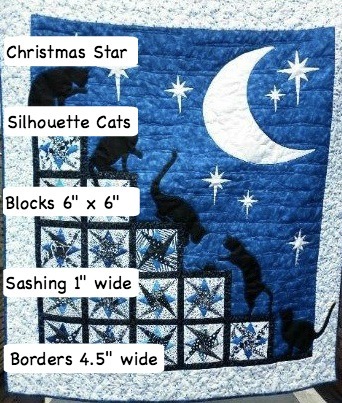 Finished quilt size for Nightime Cat Antics is 50" x 57". The quilting was done by my friend Jeannie and you will notice that the horizontal seams have been cleverly disguised by her quilting of nightime cloud formations.